Two weeks ago, as the prosecution made its final points in his corruption trial, a pale Rod Blagojevich listened nervously while his wife Patti looked on, sullen and indignant, from the bench, the arms of her brother around her. It was as if they could feel what was coming. On June 27, the jury returned from 10 days of deliberation, and everyone gathered to hear its decision. Blagojevich blew an air kiss to his weeping wife and then clasped his hands as courtroom deputy Donald Walker began reading the verdict. The first finding of guilt led Blagojevich to purse his lips. Patti pushed back into her brother's arms. With each new pronouncement of guilt, the former Illinois governor grew more stone-faced, even as his wife wept beneath closed eyes. When Walker was done reading, Blagojevich had been found guilty on 17 of the 20 counts against him, including 12 of the most explosive ones, among them wire fraud and conspiracy and attempted extortion stemming from when he tried to sell the U.S. Senate seat of then President-elect Barack Obama. (As governor, it was Blagojevich's prerogative to name a candidate to complete Obama's term.) 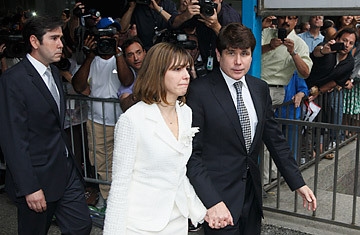 Later, as he held his wife's hand, Blagojevich told the press, "Obviously I was really disappointed with the outcome. I was frankly stunned, and there isn't much else to say." On most counts, he faces a maximum sentence of 20 years each and $250,000 in fines. Judges are unlikely to impose maximum sentences, however. It is also not known if the prison terms will be served concurrently. The parties will return to court on Aug. 1 to determine the sentencing. The members of the jury, 11 women and one man, spoke to the media afterward but did not provide their names. They indicated that Blagojevich's infamous quote  taped by the FBI  about the Senate seat's being "F---in' golden" made it easier for them to decide, after some initial debate, on his guilt. "The Senate seat was most clear. We felt he made a trade for the Senate seat," said Juror 140, a Hispanic woman who teaches third and fourth grade. The forewoman, a retired director of music and liturgy at a Naperville church, said the jurors were sending a message that the American people should be proud of a process that works even when you throw 12 people in a room who have no knowledge of the legal system. But she added that the experience did not make her feel any better about Illinois politics. "I told my husband if he was running for politics, he'd have to find a new wife," she said. This was the second trial Blagojevich faced on most of the same charges. His defense had dramatic success the first time around with a successful deployment of the element of surprise. In a stunning move last summer, Blagojevich's attorneys rested their case instead of presenting any evidence, despite their original promise that the defendant would take the stand. That left the jury drowning in the government's complex evidence of intent that nevertheless had no fully completed act of bribe taking. Irredeemably hung, the jurors were unable to convict Blagojevich or his brother Robert except on one count (lying) out of the original 24 charges. But you can't surprise all the people all the time. For the second trial, the trio of assistant U.S. Attorneys who made up the prosecution took to straightforward, focused outrage more than anything else. First they decided to drop the charges against Robert Blagojevich. Then they streamlined the charges down to 20 and made it clearer that asking for a bribe was just as bad as getting the bribe. In the government's final statement, Assistant U.S. Attorney Carrie Hamilton, a thin, petite woman with blond hair pulled back in a ponytail, asked the jury to remember how Blagojevich swore under oath in 2003 and again in 2006 to uphold the state constitution, pledging to use his powers for the people of Illinois. "You have learned that the defendant violated that oath," she said, staring down her audience. "He used his power to get things for himself and tried to trade the signing of a bill, state funding for grants, roads, and the appointment of a Senate seat to try and get things for himself. This was not only a profound violation of his oath but a violation of the law." For the second trial, the defense had a trio as well, made up of Blagojevich's longtime friend Sheldon Sorosky, a short, balding man who wore loud, dangling ties, and a pair of 30-something attorneys, Aaron Goldstein and Lauren Kaeseberg. Over the objections of the prosecutors and even Judge James Zagel, the defense tried to give the appearance that missing facts not allowed into trial would help tell all, hinting that all Blagojevich was doing was business as usual in the state of Illinois. This time around, though, they had Blagojevich testify on his behalf. The results were riotous. At one point, during a particularly voluble exchange with the prosecution, Blagojevich in the witness stand ignored calls from his own lawyers to keep quiet and blasted out retorts to the government's questions. Goldstein later joked that he may be one of the few attorneys in history to have a client talk over him. Still, the Blagojevich team may have thought the exchange would help to prove not only that the ex-governor liked to be heard but also that he was mostly talk and little action. The defense was all about crafting an image that would nullify the prosecution's arguments of a guileful, corrupt public official. They wanted to have the jury believe that the defendant was a buffoon who couldn't really do anything criminal because he wasn't competent enough to see it through. That kind of lawyerly sleight of hand didn't work this time. The jurors later said that Blagojevich's droning seven-day testimony helped them decide that he was not guilty of the charge that he attempted to extort a road builder. However, they said the same long-winded performance made it clear that Blagojevich was being manipulative. That played into the prosecution's simpler strategy. In her final argument, Hamilton, like a college professor, took the jury to conviction school, talking them through a three-hour PowerPoint presentation of the 20 counts, summarizing the most important evidence, explaining what constitutes soliciting a bribe, extortion and wire fraud. "He repeatedly broke the law," Hamilton told the jury. "It's about the destruction of the faith and trust he destroyed." The case, Hamilton said, came down to one question: "Did the defendant try to get a benefit for himself in exchange for an official act?" Over three hours, split between two days, Hamilton walked through the acts of soliciting a bribe, extortion and wire fraud. "The defendant intended to defraud. It was not a mistake or accident. He does not need to know he was breaking the law," Hamilton reminded the jury. And then she played the FBI tape in which Blagojevich talks about how he isn't giving Obama's Senate seat up for "f---in' nothing." "Listen to his voice," she told the jury. "You can hear him smiling. He's giddy." "Among the many lessons I've learned through this whole experience is to speak a little less," Blagojevich said after the verdict was read. Perhaps knowing their client and knowing the odds, his original defense team of Sam Adam Jr. and Sam Adam Sr. opted out of the rematch with the government. You can only use the element of surprise once.